#9? Is that right? I hope so. Smoking is an addiction. Knitting is an addiction. I can only go so long without it before I crave it again. Smoking has a unique and instant community. Knitting has a unique and instant community. After I quit smoking, I found myself missing that camraderie that came from smoking with other people while shivering huddled on the sidewalk in the middle of February. Now, I can share a similar camraderie, but one that involves sitting indoors in climate control, eating brownies and drinking beer. Overall, a pleasant shift (though I still kind of miss that miserable, smoky huddling). Smoking makes you look cool. Knitting makes you look cool. Well, I think it does, at least. People get really excited when they find out you made the excellent socks you’re sporting. Glorious, glorious Lotus Aura yarn. It is coming in the mail as we speak. 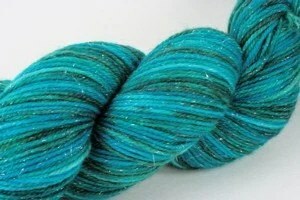 I have just now decided that I will knit the Knitty Baroque sock pattern using this yarn. It feels perfect for that. This entry was posted in Cool things, knitting and tagged knitting, socks, why I knit, yarn. Bookmark the permalink. I am so very excited to knit with the yarn; I woke up this morning and went, “Hey! I’m going to start those socks today!” before I remembered that the yarn hadn’t arrived yet. Ha. Oh wow, that yarn is totally gonna rock that pattern!! And knitting doesn’t smell bad.